Robert Louis Stevenson’s novel Kidnapped allowed N. C. Wyeth to indulge in a full-scale shipwreck painting—the result, The Wreck of the “Covenant”, is simultaneously one of the most dramatic and poetic of his works. In the painting, the young hero David Balfour is in the foreground, clinging to a yardarm as he gazes back at the ship foundering on a reef. But though the action is intense, the mood is almost meditative, dominated by the dark green billows of the ocean and the night sky above. Looking at N. C. Wyeth’s The Wreck of the “Covenant” on the third floor of the Brandywine River Museum (Chadds Ford, PA), I was reminded of an exhibit that I attended last fall at the Philadelphia Museum of Art. “Shipwreck!” focused on the back story of an American masterpiece, Winslow Homer’s The Life Line, by looking at the roots of this great painting in the subgenre of shipwreck paintings that flourished in the 18th and 19th centuries. When they painted their shipwreck dramas, Homer and Wyeth were working in a very established tradition. It was a type of painting that allowed the artist to depict nature at its most ferocious, while embellishing the scene with narrative details of heroism or tragedy. 28 5/8 x 44 3/4 inches. N. C. Wyeth wanted a career like Winslow Homer’s. Their professional lives only overlapped for a brief time. Homer made the leap from being considered a very talented illustrator to a fine artist in the 1880s (with The Life Line significantly contributing to his growing reputation) and then continued to develop his artistry through the last decades of his life. As Homer’s career drew to a close in the first years of the 20th century, young N. C. Wyeth was busy launching his career as an illustrator. Wyeth was well aware of Homer, very respectful of his work, and intent on duplicating Homer’s success in moving from well-paid illustration work to acclaim as a fine artist. A comparison of the two paintings, Homer’s The Life Line and Wyeth’s The Wreck of the “Covenant”, highlights the strengths of both. 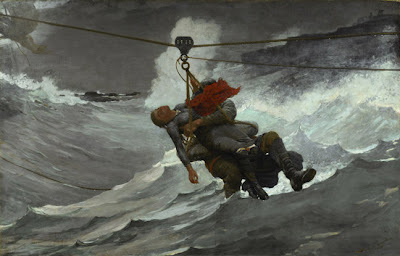 In depicting a disaster at sea, both Homer and Wyeth employ similar visual elements but to largely different effects. Each of the artists places their central character (or two characters with Homer) in the foreground, clearly the main focus for the viewer. The face of the hero figure is obscured in both, by a scarf in Homer and by a shadow in Wyeth. The artists offset these lead figures with a bright mist from the crashing of waves behind them. The shipwrecks are a secondary concern, relegated to the corners, only minimally suggested in Homer’s painting. 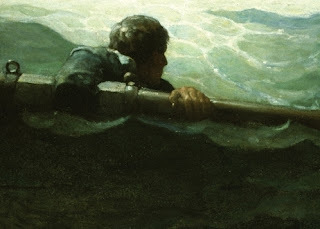 Detail of N. C. Wyeth's The Wreck of the "Covenant". Courtesy of Brandywine River Museum. Homer’s painting is packed with meaning, very well explicated in the “Shipwreck!” exhibit at the Philadelphia Museum of Art. But Homer’s concerns about man and nature, modern technology, and even gender relations are not those of Wyeth in The Wreck of the “Covenant”. Wyeth’s shipwreck scene has an altogether different feel, with young David Balfour looking almost acceptant of his position—passively taking in the sinking of the ship where he had been shanghaied. 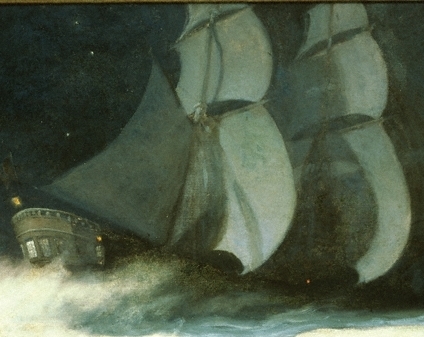 The ship looks ghostly with the white sails extending up into the heavens, perhaps intentionally suggesting the deaths of many of the men on board. The sky appears almost perversely clear with stars shining, wonderfully echoed by a single poetic red speck of light near the ship’s bow. I don’t think visitors to the Philadelphia Museum of Art were particularly surprised that Homer’s The Life Line has layers of meaning. His reputation as a fine artist is well established. But one hundred years later, people still tend to think of Wyeth as simply a very good illustrator of boys’ adventure novels. Now for just a minute forget the Robert Louis Stevenson book and take a fresh look at The Wreck of the “Covenant”. The bottom and the top third of the painting are dark scenes of calm, with the fury of nature sandwiched in the middle. There are universal implications here as well. Consider it as metaphoric—N. C. Wyeth’s vision of one man alone in a universe both beautiful and threatening.